Emed > News > 15% Off Blackmores Celloids This Week! 15% Off Blackmores Celloids This Week! Enjoy 15% off Blackmores Celloids this week! 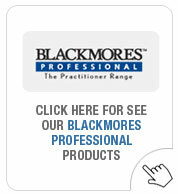 We carry a comprehensive range of Blackmores professional products. Blackmores Professional natural medicines have been developed over many years in Australia, with a strong practitioner focus. Blackmore was a true pioneer who not only singlehandedly researched and developed the modality of Celloid Mineral Therapy (which is unique to the Blackmores Professional range), but also played a major role in legitimising natural medicine in the eyes of the Australian public and ensuring its acceptance by regulatory authorities. Blackmores Professional offer safe, efficacious, and very high quality products. To find the full range, click here.